Looking for a nursing job in Saratoga County New York? Nursing RN, LPN, LVN, CNA jobs are listed below by Health Care facility in Saratoga County New York to include Saratoga Springs, Ballston, Ballston Spa, and Milton area employers. The listings here lead to the job opening or recruitment pages for hospitals and facilities in the Saratoga County area. Using these links you can find find Clinical, Behavioral / Mental Health Nursing, New York Licensed Practical Nurse LPN, Advanced Registered Nurse Practitioner, Medical Assistant, Registered Nurse RN, and Certified Nursing Assistant CNA employment opportunities. 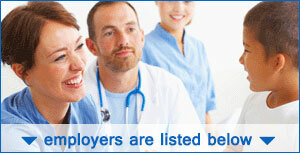 Saratoga Hospital has exciting nursing careers and offers a comprehensive benefits package. Saratoga Hospital has attained Magnet recognition for nursing excellence from the American Nurses Credentialing Center - the highest honor an organization can receive for professional nursing practice. A survey of open positions available had included Cardiovascular Interventional Technologist, Care Management Representative Emergency Department, Clinical Laboratory Technologist, Clinical Nurse Manager, Crisis Nurse - Crisis Evaluator (LCSW, LMSW), CT Technologist, Per-Diem Nursing Jobs, CT-XRay Technologist Per-Diem, EKG Tech, Emergency Department Technician, Histotechnologist, ICCU Technician, Inpatient Psychiatric Nurse Practitioner, Physician Assistant, Mental Health Physician Assistant, Licensed Clinical Social Worker- R (LCSW-R), Licensed Practical Nurse LPN, Bariatric LPN, Mammography Tech, Medical Assistant, Medical Assistant Surgery Center, Medical Imaging Tech, Mental Health Technician, Nurse Practitioner Bariatrics, Physician Assistant Pain Management, OR Tech, Patient Access Representative, Patient Care Assistant, Phlebotomist, Reception Phlebotomist, Psychiatric Nurse Practitioner, Registered Nurse Operating Room, Registered Nurse Mental Health, Registered Nurse Women's Health, Registered Nurse Emergency Services, Registered Nurse ICCU, Registered Nurse Medical-Surgical, Registered Nurse Medical-Surgical Telemetry, Respiratory Therapist, RN Charge Nurse rimary Care, Speech/Language Pathologist, Unit Secretary, and Women's Health Services Tech. Albany Med emergency physicians and select specialists see patients at the new Malta Med Emergent Care facility in Saratoga Medical Park, 6 Medical Park Drive, Malta, NY. Periodically there are open positions posted. Four Winds Saratoga is located in Saratoga Springs, and is an 88 bed psychiatric hospital serving children, as young as age five, adolescents and adults in both inpatient and outpatient partial hospitalization programs. Fourwinds Hospital Saratoga had career opportunities posted for Registered Professional Nurse. This is a clinical nurse position. Other opportunities were found that included support related positions. Visit their employment page for current listings. Saratoga County periodically posts Public Health Nursing employment opportunities such as Registered Public Health Nurse, Senior Community Mental Health Nurse, & Registered Professional Nurse. Preference will be given to applicants with background experience in maternal, pediatric and family services. The Office for People With Developmental Disabilities periodically has open positions. During review there had been an open position in Corinth for a Licensed Practical Nurse LPN. Check State Jobs New York for new listings. Saratoga Center for Rehabilitation and Skilled Nursing Care is a 257-bed facility in Saratoga County that provides quality care services in a home-like environment to suit your long-term or short-term medical needs. Open positions found had included CNA Bath Aide, Assistant Director of Nursing, RN Supervisor, Dietary Aide, Unit Manager RN, and Activities Assistant. AIM Services, Inc. currently provides services in Saratoga, Warren, and Washington counties through the Office for People With Developmental Disabilities (OPWDD). Positions found included Overnight Residential Supervisor, Program Director of Independent Services, Independent Community Support Professional (CSP), Community Support Professional - Respite and Community Habilitation, and Direct Support Professional. The Wesley Community | Wesley Senior Solultions had employment postings such as Per Diem Registered Nurse RN (Per Diem, Day), Unit Clerk, RN Supervisor, Licensed Practical Nurse LPN, Certified Nursing Assistant CNA, RN Charge, Personal Care Assistant, Home Health Aide, Companion, Resident Assistant, and more. From Emergency Room to Home Infusions, Stat Staff Professionals has the right assignment to fit your needs. We offer exclusive contracts and per diem assignments across New York State. Hedgerow House is a chemical dependence community residence program situated on a wooded, two-acre lot located in Ballston Spa, NY. Hedgerow House is designed to treat 16 men and women in recovery from alcoholism or drug addiction. Employment opportunities found had included Chemical Dependency Case Manager and Counselor. Community Hospice hires Nurses, Social Workers, and Home Health Aides. During review there were open positions for Behavioral Health Counselor, Home Health Aide Trainee, Licensed Practical Nurse LPN, Resident Assistant, RN EVNA Per Diem, Primary Care Registered Nurse RN, Family Health RN, Social Worker LMSW Hospice, and more.